As midfielder Tadhg O’Rourke makes his way to the victorious Roscommon dressing room, two young supporters stop him and request an autograph. The big Tulsk midfielder is only too happy to oblige, thanking them for their support and encouraging them to come back again next Sunday. It’s a microcosm surrounding a famous day in the Hyde, the kind Roscommon folk haven’t been used to in recent years as they celebrate a famous two-point victory. Not long afterwards, Anthony Cunningham emerges for a chat. Deep down, he’s buzzing but, as expected, the exterior doesn’t paint a picture of a manager going to lose the run of himself any time soon. “The guys showed massive character. When you’re up against Monaghan, one of the best teams in the country, and they go ahead in the last few minutes, it’s a great learning curve for any side. We’ll take all those learning points from today and put them in the bank for next weekend. “We showed great courage against a very experienced team. We’ll put that in the locker, build on it and use it. I’m sure we’ll have many days like that in the next while because all these teams are so competitive and so close,” he chirped. 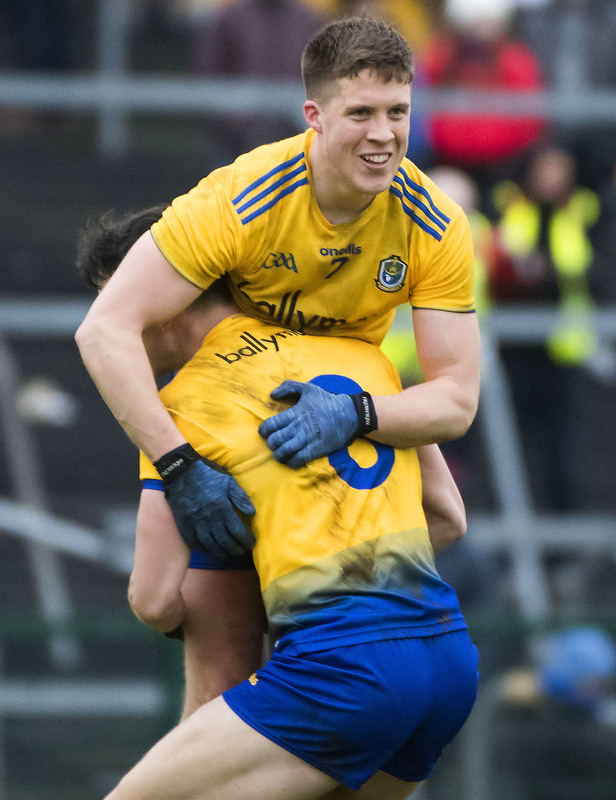 Two black cards in a minute threatened to unravel all Roscommon’s good work but they steadied the ship, helped by Enda Smith’s converted penalty. “They came very quickly and it was tough to take. You realise that the lads on the pitch have to adapt to that. We were a vital man down at midfield. One was bad enough but the second one really threatened to hurt us. But the lads played with their heads on. They made massive runs, like Ronan Daly up the wing in injury time. “We got the penalty and took it but even after that Monaghan had their chances. But we steadied the ship again and got the scores to win it,” he continued. Evan McGrath and Conor Cox came in for particular praise from the Roscommon boss. “It was a great run (in the first half) from Evan. He showed great composure beyond his years. He did everything right but Rory (Beggan) made a super save. He just got a touch to it. We just needed to be more careful with a few more shots that went wide. We’ll need to look at that during the week. “He (Cox) kicked two (frees) that were out of his range really. They were very difficult but I’m delighted for him. He’s a brilliant prospect. We’re delighted to have him. His father will be a proud man tonight. It’s the start of a long career and hopefully we’ll see many more days like that from him,” he anticipated. Cunningham went on to confirm that Diarmuid Murtagh has been given the all clear to resume full training this week following the serious eye injury he picked up last summer. Seán Mullooly is expected to return from injury in a few weeks’ time, while Brian Stack is also making good progress. “There’s great work going on in the background with Iain Daly, Mark Dowd and Noel Flynn, our strength and conditioning coach, and the backroom team. But the guys are responding. We wouldn’t be doing all this work if we weren’t getting a response. “We do need to see more players as well, and there’s a couple of players to come in. They’ll be pushing hard for starting places in the second half of the league. It was good to see Conor Devaney coming back in today. You need a very big panel. You saw the attrition out there. There were a lot of heavy hits. But it’s highly competitive with a young team, and it’s a great experience for them. Monaghan manager Malachy O’Rourke expressed his disappointment with his side’s first-half display, accepting that Roscommon were extremely hungry for success. “We gave the ball away a lot when we were attacking in the first half. We were much better after half time. We got ourselves in front and then Roscommon came back. We got control of it again and then conceded the penalty. From where I was, it looked very harsh. “But Roscommon were very hungry. That’s life in this division. We’ll have to lick our wounds and get ready for next weekend,” he pointed out.